Methods in Yeast Genetics is a course that has been offered annually at Cold Spring Harbor Laboratory for the last 45 years. 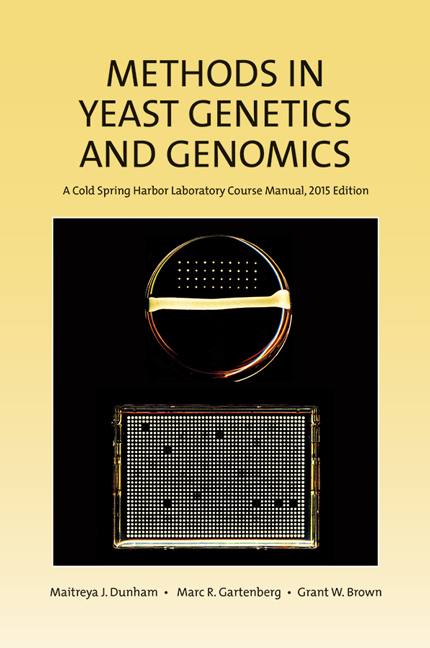 This is an updated edition of the course manual, which provides a set of teaching experiments, along with protocols and recipes for the standard techniques and reagents used in the study of yeast biology. Since the last edition of the manual was published (2005), revolutionary advances in genomics, proteomics, and imaging technologies have had a significant impact on the field. The 11 experiments included in this manual provide a foundation of methods for any modern-day yeast lab. These methods emphasize combinations of classical and modern genetic approaches, including isolation and characterization of mutants, two-hybrid analysis, tetrad analysis, complementation, and recombination. Also covered are molecular genetic techniques for genome engineering. Additional experiments introduce fundamental techniques in yeast genomics, including both performance and interpretation of Synthetic Genetic Array analysis, multiplexed whole genome and barcode sequencing, and comparative genomic hybridization to DNA arrays. Comparative genomics is introduced using different yeast strains to study natural variation, evolution, and quantitative traits. This manual covers the full repertoire of genetic approaches needed to dissect complex biological problems in the yeast Saccharomyces cerevisiae.